"Benign," by Caroline J. Orvis, in Malfeasance Occasional: Girl Trouble, edited by Claire Toohey, Criminal Intent, 2013. When was the last time I featured the first published story by an author in this column? It may have been this one by Raymond Goree last year. In any case, Ms. Orvis offers us a unique story of revenge. 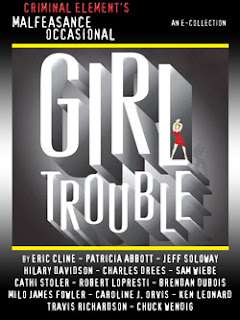 The subtitle for this issue of Malfeasance Occasional is "Girl Trouble," and in this tale it refers to female biology. The narrator had a biopsy to look for possible breast cancer. It left her with permanent pain and she isn't getting much sympathy. After all, pain is subjective; maybe it's all in her head. Why isn't she just grateful that the results were benign? She doesn't see it that way. Two years, three months, and five days of constant pain has left her bankrupt, alone, and in high rage. I started stalking my breast surgeon almost by accident. I was sitting in my car weeping, again, after the latest useless appointment. Well-written story with an ending I did not expect. A Eye For A Eye," by Wenda Morrone, in All Hallows' Evil, edited by Sarah E. Glenn, Mystery and Horror, LLC, 2013. A ten-year-old ghetto kid running drugs should be a sympathetic character, I guess. I mean ten year olds don't do that sort of thing without encouragement from people who should be taking better care of them, right? And Little J deserves a little of our sympathy, but he seems to have plenty of autonomy and street smarts as he works his way through Greenwich Village's Halloween parade, lookiug for the customer who was expecting a bag of dope. Somebody gets killed and Little J tries to find the killer before the cops can blame it on him. "The Murderer At The Cabin," by Robert Holt, in All Hallow's Evil, edited by Sarah E. Glenn, Mystery and Horror, LLC. As I have said before, occasionally I will get a page or two into a story and think Okay, the Best Of slot is yours to lose, friend. Don't screw up. Mr. Holt didn't screw up. The odd thing is, this tale is more horror than mystery, and therefore not my usual thing at all. But the concept is clever and the follow-through is close to perfect. I worried about revealing too much and everything I am about to tell you appears in the first quarter of the story. But if you have an intense dislike of spoilers feel free to stop reading this and go find the story. Lexington is a very bad fella. He's a serial killer with a complicated system of picking his victims and a suitably insane motive. As the story starts he is looking for a new person to focus his attention on. And he finds one in a cabin in the woods where a dozen wealthy people are holding a meeting. So he takes his hatchet and prepares to single out his first victim. Now, you might well be saying: hold it. This is nothing special. It's the plot of any slasher movie. Yes, but here's the twist. The people in the cabin have paid big money for a high-grade murder theatre experience, complete with elaborate props and make-up. So when Lexington starts his work they think it's part of the show. Okay, now it's up to a slightly clever slasher flick. Then how about the second twist? Unlike the seemingly omniscient monsters in those movies, Lexington doesn't know about the mystery theatre aspect and he is as baffled by his victims as they are by him. What we have here is a failure to communicate. And that's a lot of bloody fun. "Dead and Buried Treasure," by Barb Goffman, in All Hallow's Evil, edited by Sarah E. Glenn, Mystery and Horror, LLC. The creators' of this book were kind enough to send me a copy. Thirteen stories with a Halloween theme. So far, this bit of romantic suspense is my fave. At age twenty-five, Lizzie is the last member of her college crowd to remain single, a fact that her dear friends are not about mentioning. At a wedding she meets a waiter who seems like a nice guy, but those same friends -- all married to doctors and lawyers, all thinner and more attractive than Lizzie -- are incredulous of the very idea of dating a waiter. And Lizzie begins to wonder who her friends are, in more senses than one. Eventually, of course, there is a crime, and that reminded me of a very old joke about the difference between friends and real friends.